DO YOU BELIEVE there are brown recluse spiders in Washington state? When you wake up with a bug bite, do you assume it was a spider? Is it true that Daddy Long-Legs have a deadly bite, but their fangs are too short to pierce human skin? Have baby tarantulas hatched in a potted cactus, making it explode, thereby shooting baby tarantulas all over the house? Misconceptions like these are probably the reason arachnophobia (fear of spiders) is the second-most-common phobia. 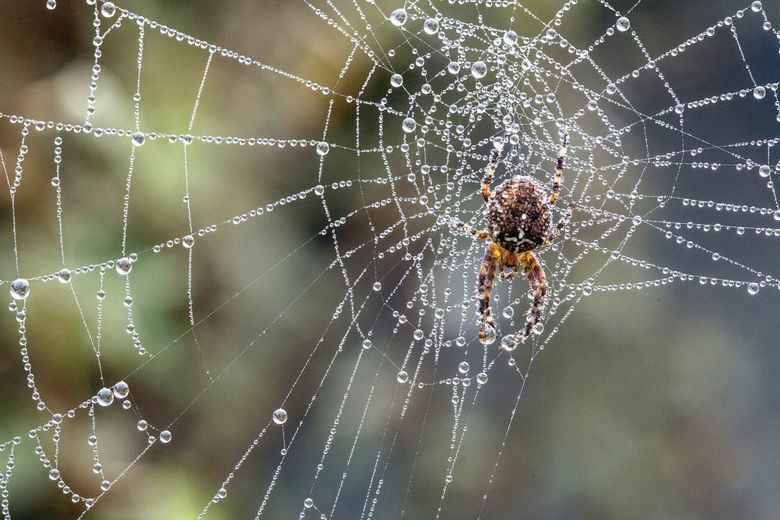 These are also just a few of the myths that Rod Crawford, Curator of Arachnids at the University of Washington’s Burke Museum, debunks in his informative and entertaining Spider Myths website. One reason people fear spiders is because they know so little about them. The truth is that few spiders are capable of hurting us, and most are incredibly beneficial. Spiders play a key role in helping to control harmful insects in our gardens and our homes. As a group, they eat more bugs than any other creature; hence, the more spiders you can attract to your garden, the less pest control you need to worry about. They also protect human health by eliminating disease-carrying insects such as mosquitoes and fleas. According to Crawford, contrary to popular belief, none of the common spiders found in Puget Sound gardens presents a serious threat to pets or humans. Although it’s true that all spiders have venom, the vast majority of them are either too small to harm humans, or the venom is too weak. Spider bites are extremely rare, and you are much more likely to be stung by a bee or a wasp. If a spider did somehow manage to bite you, it would be no worse than a bee sting, and, unlike the allergic reaction some people have to wasps and bee stings, spider venom allergies are practically unheard of. One common misconception is that there are more spiders in late summer and fall than in spring. Spiders hatch in the spring, and reproduce and die in the fall. There are just as many in spring, but they hide to keep from being eaten. We notice them more in fall because they risk coming out to find mates and make webs in order to have a place to lay their eggs. What really freaks people out are those big, scary-looking spiders that show up in our houses in late summer and fall. These terrifying-looking spiders are hobo spiders (also known as aggressive house spiders) or the similar-sized giant house spiders. These honkers can get up to three-quarters-of-an-inch long, with a leg span of 4 inches. Despite their scary size, these spiders aren’t aggressive, but shy and reluctant to bite; they try to escape when disturbed. Giant house spiders have a reputation for bites that fester and won’t heal, but according to the Washington Department of Health website, research has shown that hobo-spider venom is not capable of causing necrotic wounds. In addition, hobo spiders are endemic to Europe and have never been reported harmful there. According to Crawford, if you move these spiders outside, they most likely will die. They live in your house year-round and aren’t adapted to the harsh realities of outdoor life. Give those gentle creatures a break. Their only crime is coming out in the open to look for a sweetheart, and we all know how hard it is to play the dating game. If I’ve convinced you spiders are beneficial, there are several things you can do to attract them to help with pest control in your garden. Apply light, fluffy mulch such as grass clippings, leaves or wood chips. Plant closely, so the leaves of plants touch, and allow grass to reach 3 inches tall before mowing it to 2 inches. Avoid using nonselective, broad-spectrum pest controls because they are deadly to spiders. Finally, shake off your arachnophobia by checking out Crawford’s website. No matter what he says, however, if you notice your potted cactus starting to shake, run!! !